Protestors at City Hall were very vocal, making it difficult the hear Mayor Kathy Sheehan's remarks delivered via public address system. In stark contrast to last year, determined protestors chanted louder and louder, staying vocal for the entire presentation. A union worker holds up a protest sign. Mirroring last year's Albany State of the City address, last night’s speech by Mayor Kathy Sheehan was interrupted by the din of protestors. Disgruntled union workers were joined by activists from the Black Lives Matter movement, delaying the start of the speech by nearly 20 minutes. Sheehan was advised to press on. "Talk over them..."
In stark contrast to last year, determined protestors chanted louder and louder, staying vocal for the entire presentation. Many strained to hear the first-term Democrat, who proudly declared her administration has been busy creating a 21st century government, updating city offices and departments to a new level of technology, making investments that have improved fiscal management while centralizing administrative services and IT. "In 2017, we're going continue our implementation. We're going to move to an easy to use city-branded customer service self-portal, so that our residents can easily interact with city government to pay all of their bills at one time through one portal." Disgruntled union workers were joined by activists from the Black Lives Matter movement, delaying the start of the speech by nearly 20 minutes. Sheehan was advised to press on. The mayor touched on policing, implicit bias training, popup events to bring officers together with community members, the LEAD program, which she says successfully diverted 25 people away from criminal justice toward social rehabilitation, neighborhood meetings on police body cameras, and how officers are instructed to interact with residents. "When we looked at how our police officers were being trained in the state academy, we were concerned at the continued emphasis on warrior cops. We are building a police department that is made up of officers who are here to be part of our community. To protect our community." Sheehan proclaimed it's time to stop spending millions of dollars in band-aids to patch up South Station; she'll be appointing a task force to look into replacing it and the courthouse attached to it. "And so it's time for us to come up with a big idea. And that big idea might be building a new police station, building a courthouse that consolidates all of our courts in one building." Sheehan announced a contract has been settled with the firefighters union, and there's an initiative to make sure more minorities sign up to take the exam. She applauded growth in the warehouse district, park south and the success of her downtown residential strategy. She pointed out funding allocations to buy and rehab vacant buildings while celebrating new affordable housing. "Sheridan Hollow opened up and had a ribbon-cutting for affordable apartments that were built alongside Habitat houses in a neighborhood that was once used as a Jeopardy question as an example of urban blight." Sheehan announced that this year $1 million in assistance will be available to homeowners and developers for the purchase and rehabilitation for vacant buildings located in the city. She also gave glowing progress reports regarding the city's recycling program, improvements to city parks and the Corning riverfront, along with upgrades to the water and sewer infrastructure. "I firmly believe that the men and women of the Department of General Services deserve a raise, so let's get a contract so we can give them that raise." Sheehan says the city has been bringing equity to all neighborhoods and has actively helped residents and young people find jobs. She briefed the gathering on the progress of streetscape improvements, the traffic-calming, bike-friendly Madison Avenue road diet, and her plan to extend the program to Clinton Ave. and other streets. She thanked Governor Cuomo for the Regional Economic Development Councils. 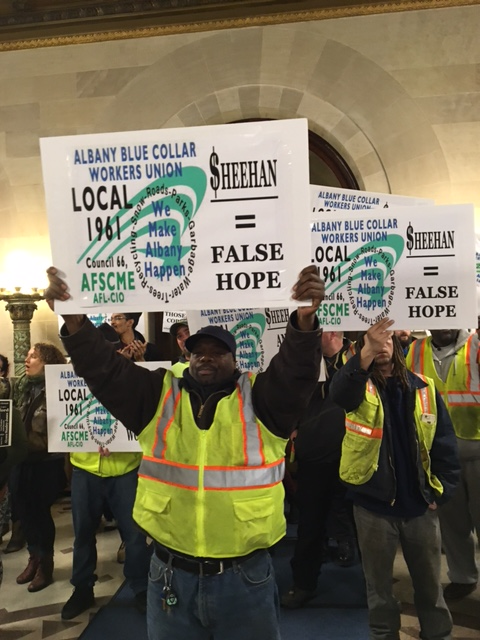 "Which have brought millions and millions of dollars to the City of Albany." She hailed the soon-to-open Albany Capital Center and lauded the 2030 plan for creating affordable housing. As protestors chanted "Kathy Trump," the city’s first female mayor spoke to the state of the city in the context of the new administration in Washington. She asked the protestors for respect. The chants grew louder. "We have a president, who, over the course of his campaign, with his own words, maligned and disparaged women, Muslims, Latinos and people with disabilities." Sheehan spoke up for those groups, and vowed Albany will remain a sanctuary city in 2017 and beyond. Sheehan concluded by quoting Dr. Martin Luther King: "We will not be silenced." In advance of expected changes in federal immigration enforcement practices and priorities under President Donald Trump, advocates fear millions of people could be affected. Steps are being taken at state and local levels to stay fears of roundups and mass deportations. Just an hour before Friday’s presidential inauguration, advocates, local lawmakers, health care professionals, faith leaders and impacted families turned out in downtown Albany to meet the National Save My Care Bus Tour for a rally opposing Republicans’ rush to repeal the Affordable Care Act. Disdain for a Donald Trump presidency and the fear of the future it could bring brought a variety of activist groups together in Albany over the weekend. The "anti-KKK Presidency Rally" was held in Townsend Park.